First let’s first focus on what economists mean by demand, what they mean by supply, and then how demand and supply interact in a market. Economists use the term demand to refer to the amount of some good or service consumers are willing and able to purchase at each price. Demand is based on needs and wants—a consumer may be able to differentiate between a need and a want, but from an economist’s perspective they are the same thing. Demand is also based on ability to pay. If you cannot pay for it, you have no effective demand. What a buyer pays for a unit of the specific good or service is called price. The total number of units purchased at that price is called the quantity demanded. A rise in price of a good or service almost always decreases the quantity demanded of that good or service. Conversely, a fall in price will increase the quantity demanded. When the price of a gallon of gasoline goes up, for example, people look for ways to reduce their consumption by combining several errands, commuting by carpool or mass transit, or taking weekend or vacation trips closer to home. Economists call this inverse relationship between price and quantity demanded the law of demand. The law of demand assumes that all other variables that affect demand (to be explained in the next module) are held constant. The demand schedule shown by Table 1 and the demand curve shown by the graph in Figure 1 are two ways of describing the same relationship between price and quantity demanded. Figure 1. A Demand Curve for Gasoline. The demand schedule shows that as price rises, quantity demanded decreases, and vice versa. These points are then graphed, and the line connecting them is the demand curve (D). The downward slope of the demand curve again illustrates the law of demand—the inverse relationship between prices and quantity demanded. Demand curves will appear somewhat different for each product. They may appear relatively steep or flat, or they may be straight or curved. Nearly all demand curves share the fundamental similarity that they slope down from left to right. So demand curves embody the law of demand: As the price increases, the quantity demanded decreases, and conversely, as the price decreases, the quantity demanded increases. Confused about these different types of demand? Read the next Clear It Up feature. Is demand the same as quantity demanded? In economic terminology, demand is not the same as quantity demanded. When economists talk about demand, they mean the relationship between a range of prices and the quantities demanded at those prices, as illustrated by a demand curve or a demand schedule. When economists talk about quantity demanded, they mean only a certain point on the demand curve, or one quantity on the demand schedule. In short, demand refers to the curve and quantity demanded refers to the (specific) point on the curve. When economists talk about supply, they mean the amount of some good or service a producer is willing to supply at each price. Price is what the producer receives for selling one unit of a good or service. A rise in price almost always leads to an increase in the quantity supplied of that good or service, while a fall in price will decrease the quantity supplied. When the price of gasoline rises, for example, it encourages profit-seeking firms to take several actions: expand exploration for oil reserves; drill for more oil; invest in more pipelines and oil tankers to bring the oil to plants where it can be refined into gasoline; build new oil refineries; purchase additional pipelines and trucks to ship the gasoline to gas stations; and open more gas stations or keep existing gas stations open longer hours. Economists call this positive relationship between price and quantity supplied—that a higher price leads to a higher quantity supplied and a lower price leads to a lower quantity supplied—the law of supply. The law of supply assumes that all other variables that affect supply (to be explained in the next module) are held constant. Still unsure about the different types of supply? See the following Clear It Up feature. Is supply the same as quantity supplied? In economic terminology, supply is not the same as quantity supplied. When economists refer to supply, they mean the relationship between a range of prices and the quantities supplied at those prices, a relationship that can be illustrated with a supply curve or a supply schedule. When economists refer to quantity supplied, they mean only a certain point on the supply curve, or one quantity on the supply schedule. In short, supply refers to the curve and quantity supplied refers to the (specific) point on the curve. Figure 2 illustrates the law of supply, again using the market for gasoline as an example. Like demand, supply can be illustrated using a table or a graph. A supply schedule is a table, like Table 2, that shows the quantity supplied at a range of different prices. 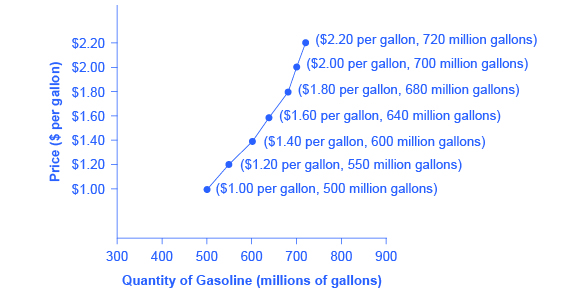 Again, price is measured in dollars per gallon of gasoline and quantity supplied is measured in millions of gallons. A supply curve is a graphic illustration of the relationship between price, shown on the vertical axis, and quantity, shown on the horizontal axis. The supply schedule and the supply curve are just two different ways of showing the same information. Notice that the horizontal and vertical axes on the graph for the supply curve are the same as for the demand curve. Figure 2. A Supply Curve for Gasoline. The supply schedule is the table that shows quantity supplied of gasoline at each price. As price rises, quantity supplied also increases, and vice versa. The supply curve (S) is created by graphing the points from the supply schedule and then connecting them. The upward slope of the supply curve illustrates the law of supply—that a higher price leads to a higher quantity supplied, and vice versa. The shape of supply curves will vary somewhat according to the product: steeper, flatter, straighter, or curved. 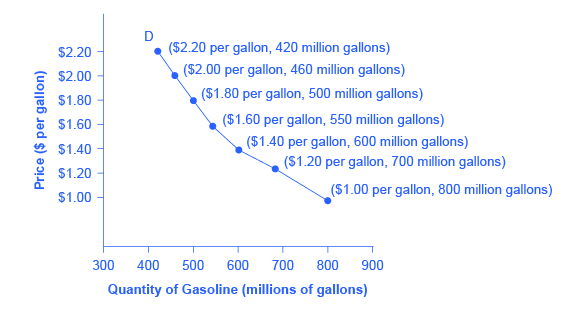 Nearly all supply curves, however, share a basic similarity: they slope up from left to right and illustrate the law of supply: as the price rises, say, from $1.00 per gallon to $2.20 per gallon, the quantity supplied increases from 500 gallons to 720 gallons. Conversely, as the price falls, the quantity supplied decreases. Because the graphs for demand and supply curves both have price on the vertical axis and quantity on the horizontal axis, the demand curve and supply curve for a particular good or service can appear on the same graph. Together, demand and supply determine the price and the quantity that will be bought and sold in a market. Figure 3 illustrates the interaction of demand and supply in the market for gasoline. The demand curve (D) is identical to Figure 1. The supply curve (S) is identical to Figure 2. Table 3 contains the same information in tabular form. Figure 3. Demand and Supply for Gasoline. The demand curve (D) and the supply curve (S) intersect at the equilibrium point E, with a price of $1.40 and a quantity of 600. The equilibrium is the only price where quantity demanded is equal to quantity supplied. At a price above equilibrium like $1.80, quantity supplied exceeds the quantity demanded, so there is excess supply. At a price below equilibrium such as $1.20, quantity demanded exceeds quantity supplied, so there is excess demand. Remember this: When two lines on a diagram cross, this intersection usually means something. The point where the supply curve (S) and the demand curve (D) cross, designated by point E in Figure 3, is called the equilibrium. The equilibrium price is the only price where the plans of consumers and the plans of producers agree—that is, where the amount of the product consumers want to buy (quantity demanded) is equal to the amount producers want to sell (quantity supplied). This common quantity is called the equilibrium quantity. At any other price, the quantity demanded does not equal the quantity supplied, so the market is not in equilibrium at that price. 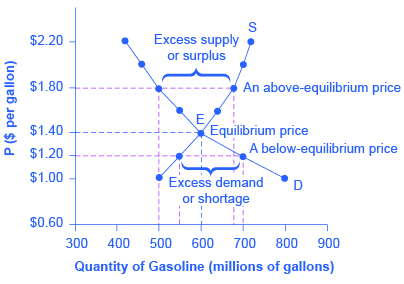 In Figure 3, the equilibrium price is $1.40 per gallon of gasoline and the equilibrium quantity is 600 million gallons. If you had only the demand and supply schedules, and not the graph, you could find the equilibrium by looking for the price level on the tables where the quantity demanded and the quantity supplied are equal. The word “equilibrium” means “balance.” If a market is at its equilibrium price and quantity, then it has no reason to move away from that point. However, if a market is not at equilibrium, then economic pressures arise to move the market toward the equilibrium price and the equilibrium quantity. Imagine, for example, that the price of a gallon of gasoline was above the equilibrium price—that is, instead of $1.40 per gallon, the price is $1.80 per gallon. This above-equilibrium price is illustrated by the dashed horizontal line at the price of $1.80 in Figure 3. At this higher price, the quantity demanded drops from 600 to 500. This decline in quantity reflects how consumers react to the higher price by finding ways to use less gasoline. Moreover, at this higher price of $1.80, the quantity of gasoline supplied rises from the 600 to 680, as the higher price makes it more profitable for gasoline producers to expand their output. Now, consider how quantity demanded and quantity supplied are related at this above-equilibrium price. Quantity demanded has fallen to 500 gallons, while quantity supplied has risen to 680 gallons. In fact, at any above-equilibrium price, the quantity supplied exceeds the quantity demanded. We call this an excess supply or a surplus. With a surplus, gasoline accumulates at gas stations, in tanker trucks, in pipelines, and at oil refineries. This accumulation puts pressure on gasoline sellers. If a surplus remains unsold, those firms involved in making and selling gasoline are not receiving enough cash to pay their workers and to cover their expenses. In this situation, some producers and sellers will want to cut prices, because it is better to sell at a lower price than not to sell at all. Once some sellers start cutting prices, others will follow to avoid losing sales. These price reductions in turn will stimulate a higher quantity demanded. So, if the price is above the equilibrium level, incentives built into the structure of demand and supply will create pressures for the price to fall toward the equilibrium. Now suppose that the price is below its equilibrium level at $1.20 per gallon, as the dashed horizontal line at this price in Figure 3 shows. At this lower price, the quantity demanded increases from 600 to 700 as drivers take longer trips, spend more minutes warming up the car in the driveway in wintertime, stop sharing rides to work, and buy larger cars that get fewer miles to the gallon. However, the below-equilibrium price reduces gasoline producers’ incentives to produce and sell gasoline, and the quantity supplied falls from 600 to 550. When the price is below equilibrium, there is excess demand, or a shortage—that is, at the given price the quantity demanded, which has been stimulated by the lower price, now exceeds the quantity supplied, which had been depressed by the lower price. In this situation, eager gasoline buyers mob the gas stations, only to find many stations running short of fuel. 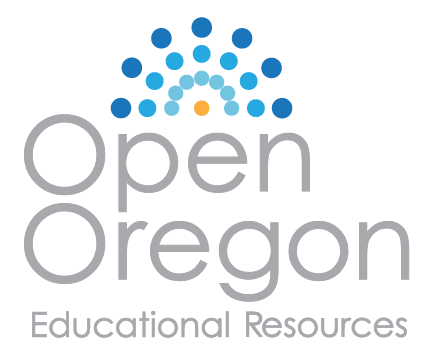 Oil companies and gas stations recognize that they have an opportunity to make higher profits by selling what gasoline they have at a higher price. As a result, the price rises toward the equilibrium level. Read Demand, Supply, and Efficiency for more discussion on the importance of the demand and supply model. A demand schedule is a table that shows the quantity demanded at different prices in the market. A demand curve shows the relationship between quantity demanded and price in a given market on a graph. The law of demand states that a higher price typically leads to a lower quantity demanded. A supply schedule is a table that shows the quantity supplied at different prices in the market. A supply curve shows the relationship between quantity supplied and price on a graph. The law of supply says that a higher price typically leads to a higher quantity supplied. The equilibrium price and equilibrium quantity occur where the supply and demand curves cross. The equilibrium occurs where the quantity demanded is equal to the quantity supplied. If the price is below the equilibrium level, then the quantity demanded will exceed the quantity supplied. Excess demand or a shortage will exist. If the price is above the equilibrium level, then the quantity supplied will exceed the quantity demanded. Excess supply or a surplus will exist. In either case, economic pressures will push the price toward the equilibrium level. Review Figure 3. Suppose the price of gasoline is $1.60 per gallon. Is the quantity demanded higher or lower than at the equilibrium price of $1.40 per gallon? And what about the quantity supplied? Is there a shortage or a surplus in the market? If so, of how much? What determines the level of prices in a market? What does a downward-sloping demand curve mean about how buyers in a market will react to a higher price? Will demand curves have the same exact shape in all markets? If not, how will they differ? Will supply curves have the same shape in all markets? If not, how will they differ? What is the relationship between quantity demanded and quantity supplied at equilibrium? What is the relationship when there is a shortage? What is the relationship when there is a surplus? How can you locate the equilibrium point on a demand and supply graph? If the price is above the equilibrium level, would you predict a surplus or a shortage? If the price is below the equilibrium level, would you predict a surplus or a shortage? Why? When the price is above the equilibrium, explain how market forces move the market price to equilibrium. Do the same when the price is below the equilibrium. What is the difference between the demand and the quantity demanded of a product, say milk? Explain in words and show the difference on a graph with a demand curve for milk. What is the difference between the supply and the quantity supplied of a product, say milk? Explain in words and show the difference on a graph with the supply curve for milk. Review Figure 3. Suppose the government decided that, since gasoline is a necessity, its price should be legally capped at $1.30 per gallon. What do you anticipate would be the outcome in the gasoline market? Review Figure 3 again. Suppose the price of gasoline is $1.00. Will the quantity demanded be lower or higher than at the equilibrium price of $1.40 per gallon? Will the quantity supplied be lower or higher? Is there a shortage or a surplus in the market? If so, of how much? Costanza, Robert, and Lisa Wainger. “No Accounting For Nature: How Conventional Economics Distorts the Value of Things.” The Washington Post. September 2, 1990. European Commission: Agriculture and Rural Development. 2013. “Overview of the CAP Reform: 2014-2024.” Accessed April 13, 205. http://ec.europa.eu/agriculture/cap-post-2013/. Radford, R. A. “The Economic Organisation of a P.O.W. Camp.” Economica. no. 48 (1945): 189-201. http://www.jstor.org/stable/2550133. Since $1.60 per gallon is above the equilibrium price, the quantity demanded would be lower at 550 gallons and the quantity supplied would be higher at 640 gallons. (These results are due to the laws of demand and supply, respectively.) The outcome of lower Qd and higher Qs would be a surplus in the gasoline market of 640 – 550 = 90 gallons.